A planetary gear is well known for its use in automotive mechanics. It transfers power from a sun wheel to the planet wheels and the ring. 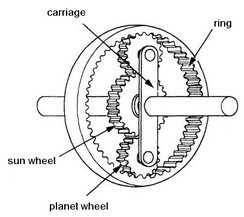 In standard planetary gears, the planet wheels are connected by a carriage. I.e the gear has three rotation ports: the sun, the carriage and the ring. The model that is used here is ideal. I.e. there is only power flow between the three axes. No internal dynamics or friction are incorporated. If the inertia cannot be neglected, you can easily add inertia models to the ports of the planetary gear model.